Common causes of Labrador retriever skin problems include parasites (ticks, fleas), environmental allergies (atopy) and food allergy. 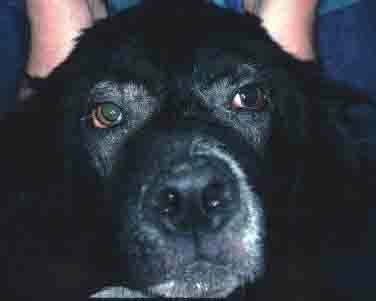 A Veterinarian will assess any skin condition based on the appearance and location of the problem. For example, fleas tend to cause issues in areas a dog cannot reach to scratch so it is rare to see symptoms on the face or front of the body. Atopy or inhaled allergies can affect the ears and cause infection, as well as the feet, face, armpits and legs. A dog food allergy will cause symptoms all over the body. Parasitic issues tend to affect a specific or local area. In puppies, a dull coat indicates a parasitic problem such as worms which may have been inherited from the mother. Other common causes include bacterial or fungal infection, environmental diseases (frostbite, burns), nutritional problems, and inherited conditions. See the Dog Health Guide for detailed information on dog skin conditions. A condition commonly called dog hot spots are the result of scratching or licking the skin in reaction to a problem such as as as a dog skin infection. Ticks are the biggest factor when we talk about Labrador Retriever skin problems.Ticks and other parasites are a particular problem of course in the warmer months as your Labrador will typically tend to spend most of his summer time outdoors. Because of this it is very important to be careful about parasites, bugs and other micro-organisms that can harm your Lab while he gets his leisurely whiff of fresh air. Any one of these pests can cause a lot of nuisance and damage but ticks are the number one enemy of a Lab owner since, like fleas, they carry diseases. Basically they are horrible. They are arthropods which means they have eight legs and appear round and flat. That is unless they have managed to gorge themselves on the blood of your unfortunate Lab in which case they will be bloated and have the appearance of a baked bean on legs. They are a big contributor to cases of Labrador Retriever skin problems. Ticks transmit themselves by climbing up taller structures or plants and drop onto any living and moving human or animal though they can also be dropped onto your Lab or into your garden by birds. The danger of diseases or kinds of diseases transmitted by ticks depends upon the country and climate, but the danger of having ticks on your dogs body begins once the tick bites. The bite itself is painless and unfeeling but the place of bite might get infected in no time. 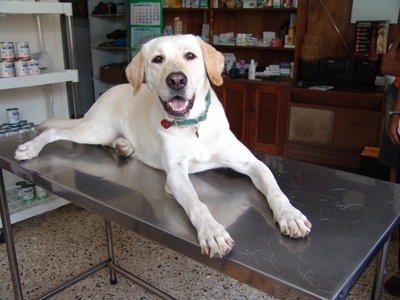 Consulting a veterinarian is advisable for treatment which normally involves oral antibiotics. The most common disease spread by a tick bite is Lyme disease. This very unpleasant condition can actually cripple a human never mind a Lab but don’t be alarmed, your vet will be able to tell you how high the risk of Lyme Disease is for your geographical location. The best way to avoid ticks is to avoid walking your dog in the midst of dense vegetation during tick season. For this reason it is important to always keep the vegetation around your house trimmed and avoid overgrown fields when out walking. Prevention is always better than cure and certain preventive products are available though your vet will be able to advise on the best products to use in your area. Do not use any medications without consulting your vet and ensure that the products instructions are closely followed. When your dog comes back from outdoors make sure to check him carefully for ticks. They are normally found in warm body areas, under the arms, in the ears, between the toes and in the folds of the skin. If you find any ticks, remove them carefully. Do not touch the tick, use an alcohol swab, then pull it up slowly with tweezers. The easiest way is with a tool called a ""Tick Off" which you can purchase online for under $10. It is well worth the investment. Make sure that you do not leave any parts of the tick sticking to your dog, for example if you pull off the ticks body you may leave its head in the Labs skin; this will cause an infection. After removing the tick clean the bite with iodine or alcohol before applying antiseptic ointment. If you are unsuccessful at removing the tick or you have any reason to be concerned contact your vet immediately. Dog allergies or canine atopy as it is also called refers to inhaled allergens such as pollen. Symptoms are usually seen on the armpits, ears, front legs and face. There is no cure for an inhaled allergy, with the best option seeking a way to control exposure. For example, if a dog suffers during the summer, limit the time outdoors. Owners can also keep the indoors allergy free with the use of a vacuum cleaner that has a Hepa filter such as the top rated Hoover WindTunnel. Bathing can also help a dog with inhaled allergies to remove the substance from the dog coat. A good choice is a conditioning shampoo such as DermaPet Conditioning Shampoo. Canine hot spots are self inflected Labrador Retriever skin problems that are caused by the dog licking or itching a problem area. The scratching or licking can also introduce infection. The original problem can be atopy. This means that in order to resolve the hot spots, the canine atopy needs to be addressed. Canine hot spots can be treated by removing the hair around any infected area. Then bathe the dog using a hypoallergenic shampoo to remove from the coat any substances causing the allergic reaction. Next apply a dog benzoyl peroxide shampoo to the coat and let soak in as suds for 5 to 10 minutes. After leaving the shampoo on the dog rinse and dry the coat. See a veterinarian if you do not see immediate improvement. A dog food allergy can be caused by any food component and will lead to Labrador Retriever skin problems. The best approach is to provide the dog with a simple diet that contains one carbohydrate (rice) and protein (duck). If the skin allergy heals, then a food allergy is confirmed. Ingredients are then added back to the diet until dog skin problems reappear. The last ingredient added is the suspect cause and is eliminated from the diet. If this approach doesn't work, but canine food allergies are still suspected, a Veterinarian will recommend a hypoallergenic prescription dog food diet.